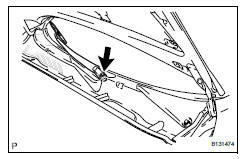 Detach the claw and remove the front fender to cowl side seal. 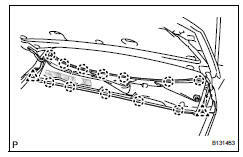 Detach the 12 claws and remove the louver. 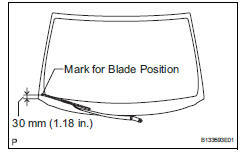 Move the wiper cushion in the direction shown by the arrow in the illustration to detach the wiper cushion from the body, and remove the wiper motor and link. 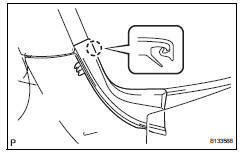 Disconnect the connector and detach the clamp. 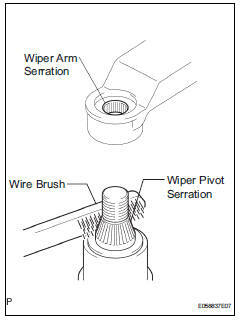 Using a screwdriver, disconnect the rod of the wiper link from the wiper motor as shown in the illustration. 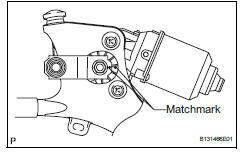 Put matchmarks on the crank arm and motor, as shown in the illustration. Connect the battery's positive (+) lead to terminal 5 (+1) and the negative (-) lead to terminal 4 (e), and check that the motor operates at low speed (lo). 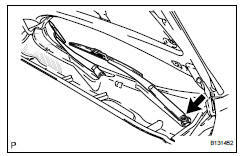 Ok: motor operates at low speed (lo). 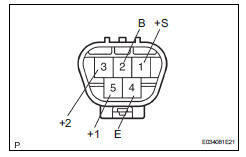 Connect the battery's positive (+) lead to terminal 3 (+2) and the negative (-) lead to terminal 4 (e), and check that the motor operates at high speed (hi). 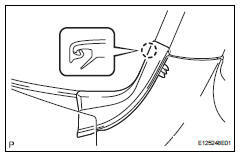 Ok: motor operates at high speed (hi). 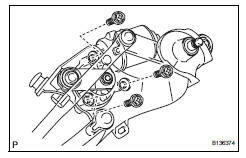 Check the automatic stop operation. Connect the battery's positive (+) lead to terminal 5 (+1) and the negative (-) lead to terminal 4 (e). 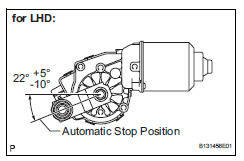 With the motor rotating at low speed (lo), disconnect terminal 5 (+1) to stop the wiper motor operation at any position other than the automatic stop position. Using sst, connect terminals 1 (+s) and 5 (+1). 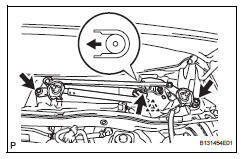 Then connect the battery's positive (+) lead to terminal 2 (b) and the negative (-) lead to terminal 4 (e) to restart the motor operation at low speed (lo). Check that the motor stops automatically at the automatic stop position. 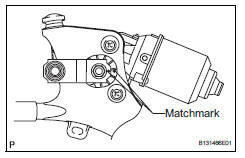 Align the matchmarks on the crank arm and motor. 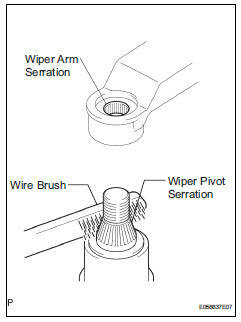 Apply mp grease to the sliding parts of the wiper motor and the rod of the wiper link. 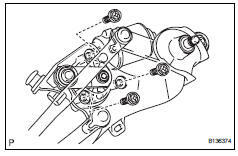 Connect the rod of the wiper link to the wiper motor. 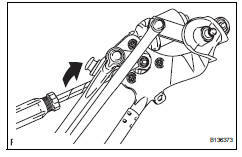 Move the wiper motor and link in the direction shown by the arrow in the illustration to attach the wiper cushion to the body, and install the wiper motor and link. Attach the 12 claws to install the louver. 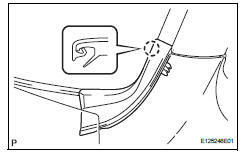 Attach the claw to install the front fender to cowl side seal. 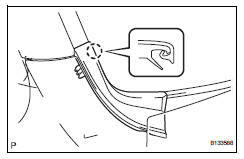 Hold down the arm hinge with your hand while tightening the nut. 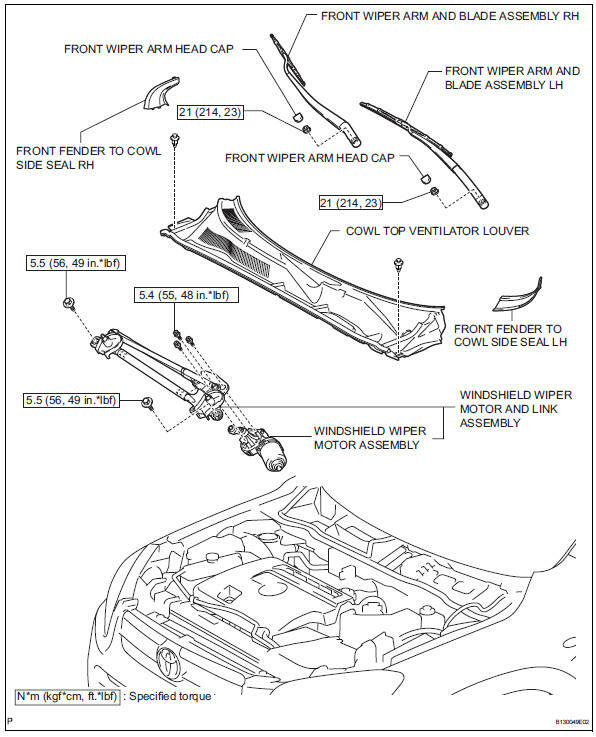 Operate the front wipers while spraying water or washer fluid on the windshield. 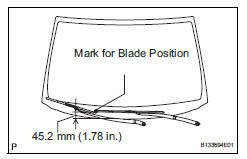 Ensure that there is no interference between the blades and pillar.